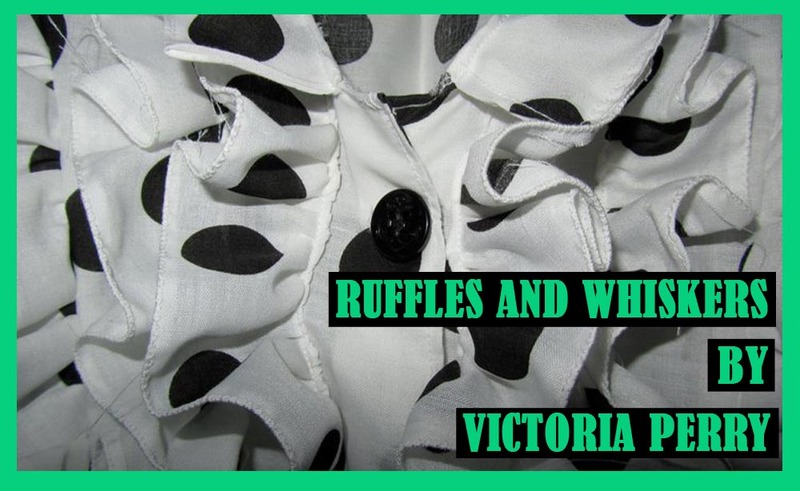 Ruffles & Whiskers: Time For Tea Blouse! My mustard peplum blouse is on standby as I can't find any lining that I like! So to make up for this I've made another blouse using the Burdastyle JJ Pattern, except this time I've left out the ruffles, and have given it sleeves. I've also used contrasting fabric for the collar & sleeves, which I think looks good, and gives a nice break from the floral print. The first steps are to create the front centre folds which will hold the buttons & buttonholes. Then to sew the front centre & front sides together, as well as the centre back & side backs together, then attach right sides facing at the shoulder seams, which will leave you with the image below. As with the majority of seams, I trim & neaten with a zig zag stitch then press. After sewing the side seams together, it's then time to make the sleeves using gathered stitching to make everything fit. Then you attach the finished sleeve to the armhole, again using gathered stitching. After both sleeves have been attached, the only things left to do is to hem the bottom, create buttonholes & attach buttons! And this is the finished blouse!